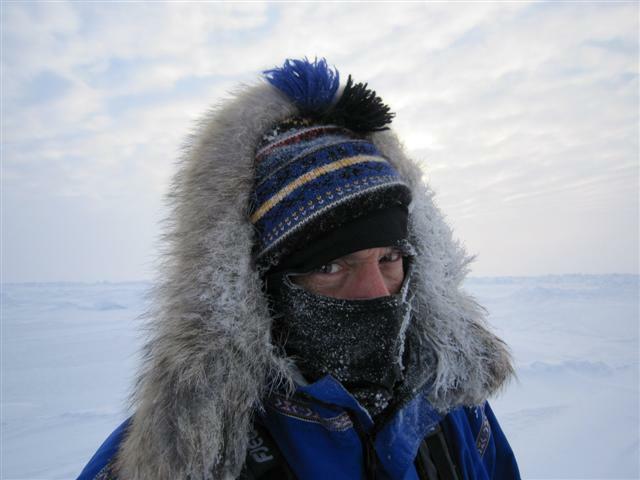 Day 9 on the ice….. Started out early this am trying to get the distance done…only to spend almost 4 hours to get 1.7 miles! Ice cubes, water – Dale dipped his toe in (he didn’t want to be left out) – but nothing else. He is absolutely fine. 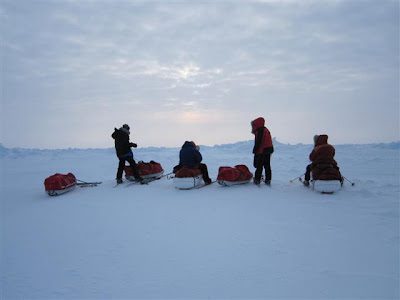 We are at 89.45 East 129 – 15 miles left to go…..
Everyone is doing well, the difference today was the cold, man was it cold – 25 plus windchill putting it down to about -40. The kind of cold that defies explanation – damp as well. We came into camp and the wind really picked up – major challenge for fingers and toes. The two polar cowboys continue to amaze finding paths through the chaos. Stay safe and may the winds blow in your favour. Waiting patiently for my new heart and lungs so one day I can join you on these crazy adventures. Your pictures make everything so real – it's one thing to read it – it's another to see it. 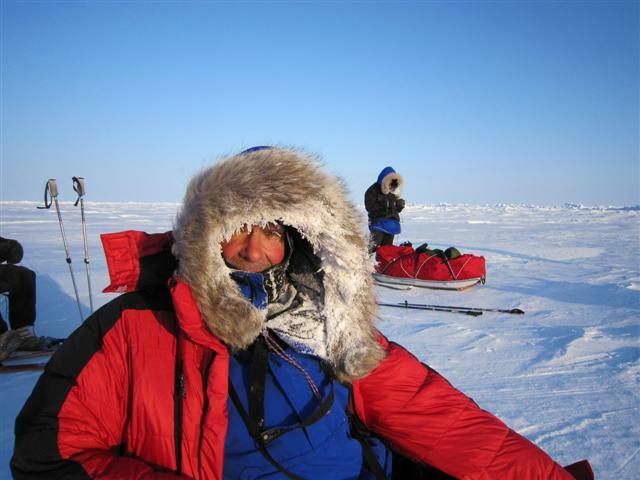 Two friends arrive to the North Pole after 2 weeks. After having built an igloo, one of then leaves to find some food. OK, maybe I can get my head around lasagna in a pot….. but salami and bagels!?!?! Glad to hear that you are all eating well. It's amazing to follow your progress. Hoping Mother Nature cooperates. Ski on, be safe…. and please try to keep Nellie in check!